"I am a president of peace. Not of war." said president Poroshenko. The problem is: his country is at war whether he likes it or not. But Poroshenko knows it is a war he can not win. Because Putler has nukes (and many other nasty tricks of course). E.V.E.R.Y single time Ukraine upscaled it's response to the Russian aggression to counter it, the Russians upscaled THEIRS even more. And where does that end? If the road of upscaling-aggression would be walked, in the end Putin would use nukes. And Ukraine does NOT have an answer to that. So an all out war with Russia... Ukraine will loose that. Period. And THUS Ukraine seeks help from the West and started with an unilateral ceasefire and later Minsk bilateral, EVEN THOUGH everybody knew the Russians would use it to restructure and reinforce their forces in Ukraine. 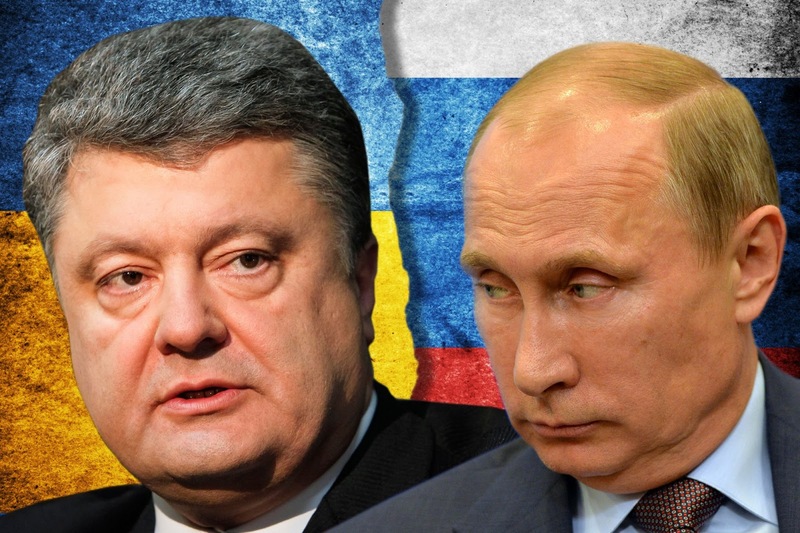 But Ukraine can not win the war against Putler without the West. That's why Poroshenko listens to them. To get their help. And THEY say: don't fight. Because the West does not want war. Not in Europe but neither in Ukraine. It's bad for business! So the West hesitates. Lingers. Tries to find a 'diplomatic solution'. And they tell Poroshenko: do not fight, because we will sanction Putin. Show the world HE is the aggressor and not you and we will hit him in his pocket. Why they do it this way? Why not send weapons? We don't want a nuclear war. We don't want upscaling-aggression all the time with the use of nukes in the end. Sanctions are working pretty good when you look at the Ruble. But it's not good enough. Because it takes a loooot of TIME before it really has a good effect. But ALSO because the West does not understand Putins game. Putin does not play by the rules. That is: OUR rules. Putin has his own set of rules and PRETENDS to play OUR game. That's why he is able to endlessly fool Western diplomats. If sanctions hurt Putin... he will STEAL what he needs to survive. He STEALS Crimea. He STEALS coal from Donbas and sells it to Ukraine who has no option but to buy it. He steals a complete factory for helicopter engines from Donbas, transports it in his humanitarian white trucks and builds it up again somewhere in Russia. Putin will STEAL from the West too. Mark my words. He will if he needs to do that for his survival. Because NOBODY can get Putin and his gang. Why? He has nukes. Imagine... one bomb on Berlin and Europe is out. Because what we gonna do? Nuke back? And get an all out Nuke war? We don't want THAT. And THUS the West has to allow Putin grabbing what he wants and HOPING things will get better anyways. But what the West does not fully understand is that they have REALLY GONE MAD in Russia. Beyond imagination. To this point that almost all of them believe the crazy propaganda they produce themselves. It is a vicious circle they are in. A VERY aggressive one. AND they have nukes... a lot of them! Putin is going to grab what he wants with force. If anybody wants to stop him, he will upscale. Our collective (Ukrainian AND European) dilemma is this: How much will we allow him to grab before we say it is enough? Until he is in Berlin? You think he will not go to Berlin? His bombers capable of delivering nukes have already been in Portugal. Of course he will. U.N.L.E.S.S somebody or something stops him. And therefor the ULTIMATE question we have to ask ourselves is this: how are we going to deal with Putlers nukes if he would start to use them? Do we have an answer to that? If we DON'T have this answer, he will eventually (between now and so many years) run all over Europe with his crappy tanks, with uncountable victims.